Taking a short break from my Lovecraftian Alphabet project I though I'd show you something else I've been working on. I've been out of a steady full-time job since early 2012, surviving on various work opportunities popping up and going away again. Right now I'm working half-time at a project called "Media Power", where special needs people of all ages learn how to blog, make interviews, do pod casts, make videos, and generally find out how to use the free social medias to promote themselves and their various interests. I'm the technical go-to guy, and I also try to think up fun stuff for the crowd to do. We have some pretty good actors in the gang, and a few of them enjoy making dramatic films. Two of the guys and I decided to do a humorous sci-fi short, where nefarious aliens kidnap earth people. 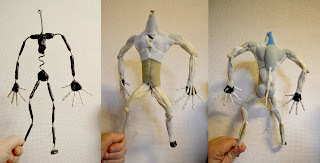 To portray the aliens we concluded that cartoonish animated puppets would best do the trick. 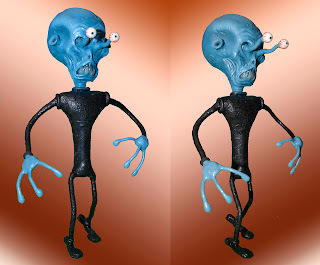 I built only one alien and cloned it in After Affects, after multiple animations in StopMotionPro. The idea was that the aliens, looking like they jumped off the cover of an old sci-fi pulp magazine, would also be cloned, or at least looking all the same. 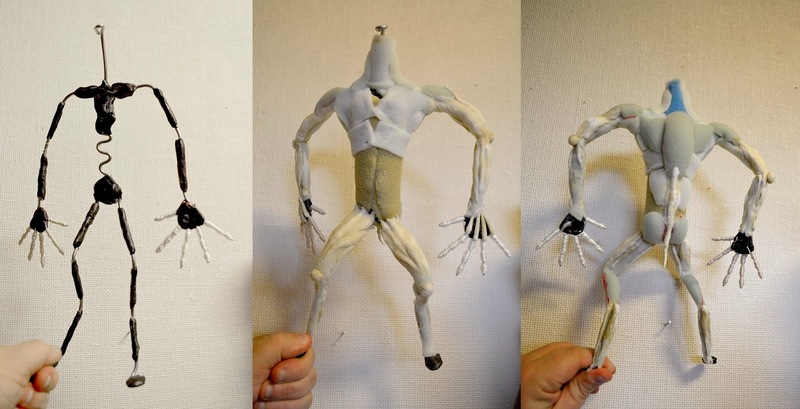 The alien puppet armature was a very simple affair, having no "bones" in the body. I used thick aluminum wire for the whole thing, apart from the fingers and a small joint for the tips of the feet. 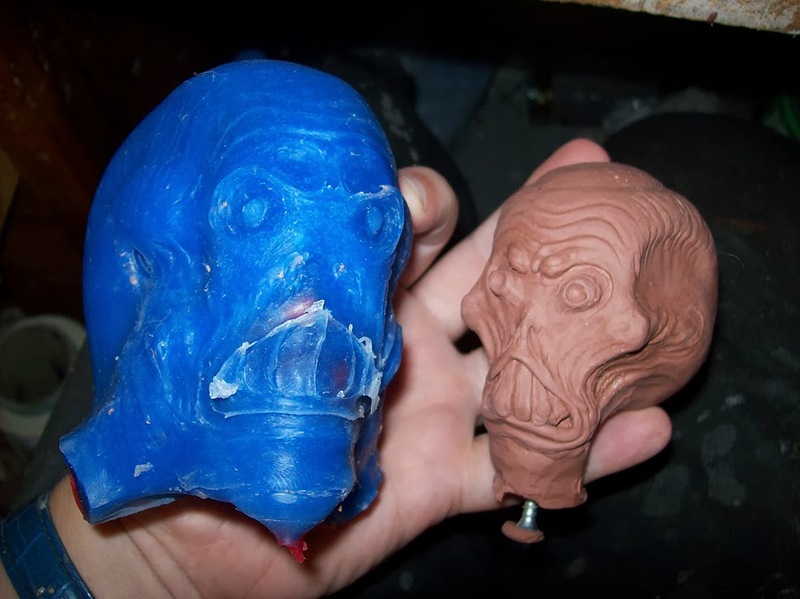 I also did something else different from my usual puppet projects; I cast the head in hard plastic instead of soft latex. I decided that the aliens would have a mouth-like organ, but not speak visibly with it, thus relieving me from hours of synced mouth animations. The only thing moving and emoting would be a pair of eyes on stalks. 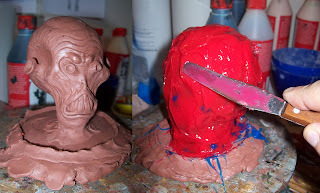 Thus I sculpted the head in my usual fashion using Chavant clay, but made a mould out of silicone instead of plaster. This being the excellent, soft DragonSkinPro from SmoothOn, the sculpture came out of the mould almost intact. 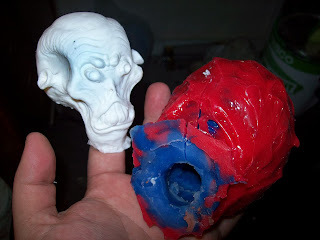 I used a SmoothOn 325 plastic poured into the mould and sloshed around to create a strong, hollow shell. 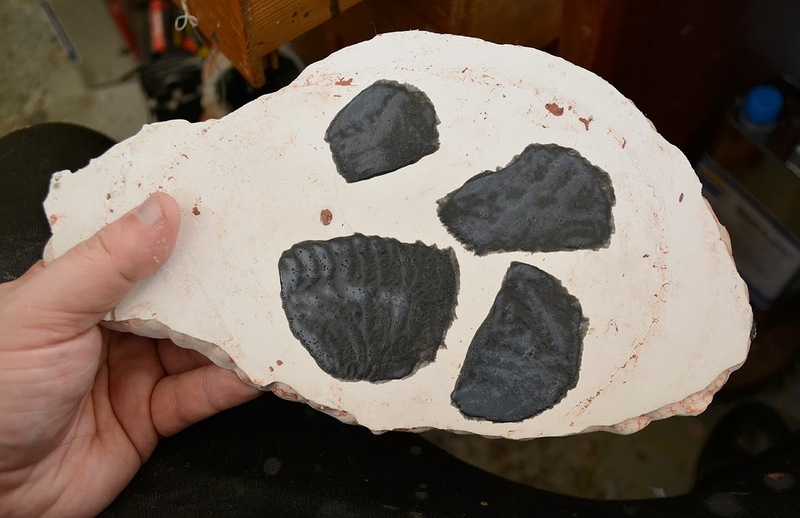 The finished casting was very light, and quite strong in itself.. 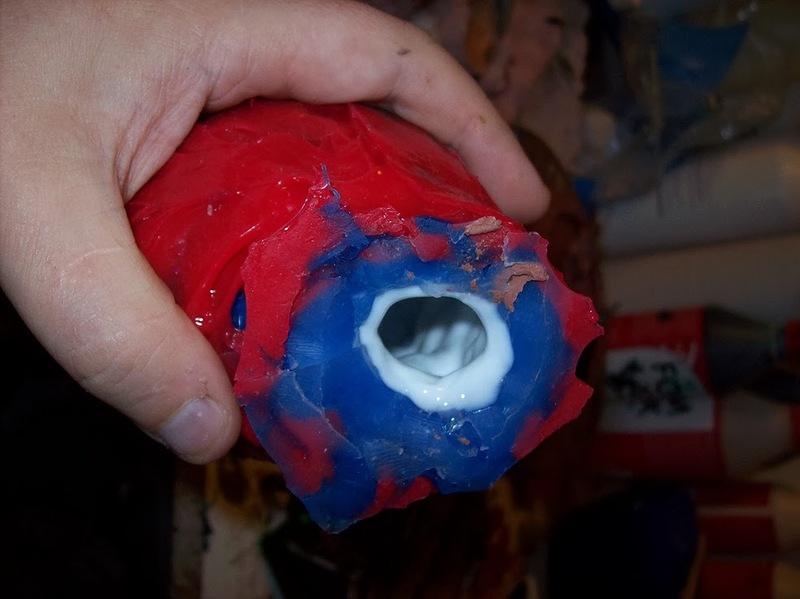 ..But I decided to reinforce it further by adding expanding polyurethane foam. 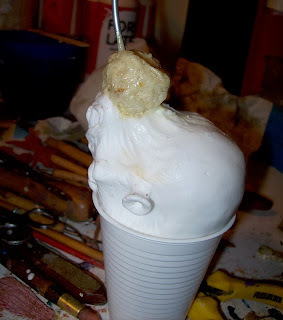 While the foam was setting I pressed down a looped aluminum wire into the head, creating the neck joint. The eye stalks were two bits of aluminum wire wrapped in soft string, with plastic balls attached to the ends. 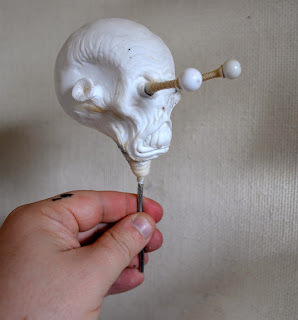 The stalks were held in place within the skull with Friendly Plastic thermoplastic. You can also see that the neck has been covered with more string wrapping. After attaching the head to the body, the armature was padded with bits of thin sheet foam. The arms, legs, feet and fingers were wrapped in string covered with tinted latex. To make the aliens look even more sterile and cloned I decided to give them black rubbery suits, with very few details. I cast small pieces of tinted latex on the back of an old plaster mould to create a smooth surface for the suits. Why not use a plastic tray, a table, a mirror, or any other REALLY smooth surface to cast the latex on, one may ask? Because the latex takes longer to dry on a non-absorbing surface, and the porous plaster creates a matte surface on the latex, making it much easier to remove and handle. Give both ways a try, and you'll appreciate not having the headaches of latex pieces sticking to themselves because of their perfectly smooth, but hideously self-attaching backside. That takes care of the body. The hands and eye stalks were painted with tinted latex, while the plastic head was airbrushed using acrylic colours. There you have it: One nasty alien invader. Ready to be animated. To place our intrepid hero, Andreas, on an examination table in the alien spacecraft, he simply laid down on the floor in an empty room in the building where we have our office. We didn't have any proper chroma key screen there, so we simply put some red pillows behind his head, creating a neutral background, that could be removed digitally. 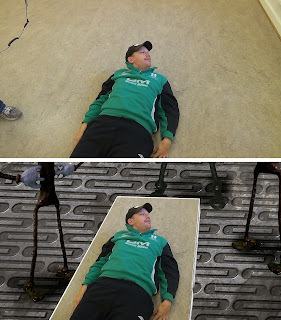 The rest of his body and a part of the floor was cut out using the matte tracking tool in AE. The alien was animated as three characters, and all of it was keyed onto a stock spaceship background. 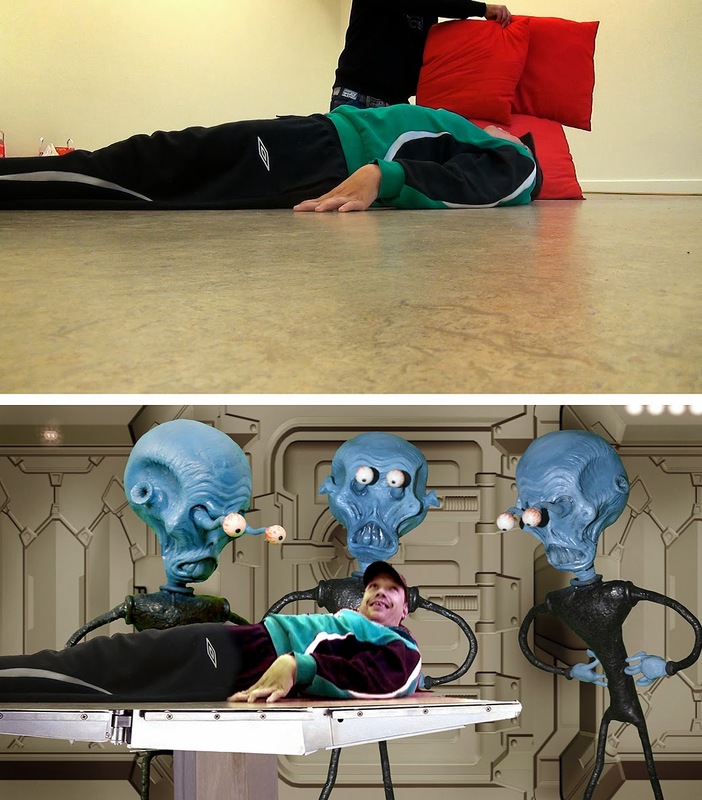 Instead of shooting Andreas as a chroma key subject and adding him to a background, I did a more old-fashioned matte shot, superimposing a photoshopped image over shots of him lying on the floor. This kept him as an element of much better image quality than a chroma key shot would've produced. And how does humanity defeat the pesky aliens? This particular day, Andreas had enjoyed a too hefty baked beans lunch, and we find out just how sensitive to gaseous anomalies these aliens are. It's taking awfully long between my blog posts, isn't it? I've therefore decided to make shorter posts, hopefully once a week, so those of you really interested in my craft will have something to look at more often. Anyone familiar with H P Lovecraft's short story "Pickman's Model"? 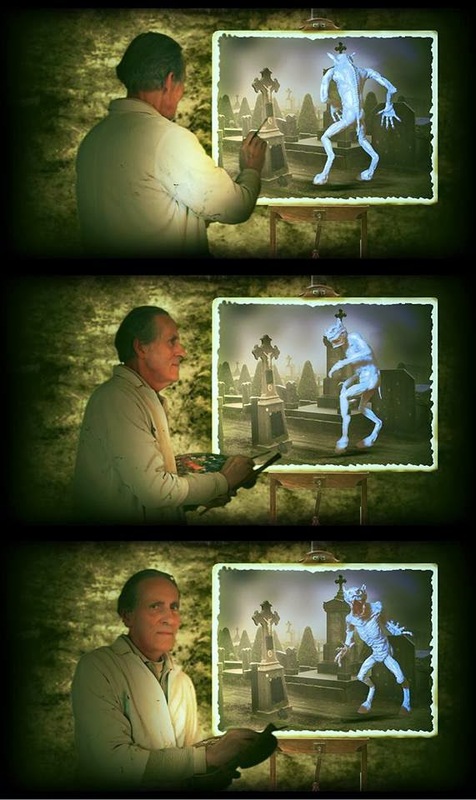 It's about an artist who paints horrific tableau's, often depicting creatures Pickman calls ghouls. One painting in particular is especially lifelike, and the narrator eventually finds a photo showing the monstrous ghoul portrayed. Pickman later disappears. 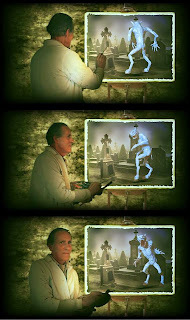 Well, he does appear in my Lovecraftian alphabet film, as does a ghoul. In other words I had to find my Pickman, and build a ghoul. 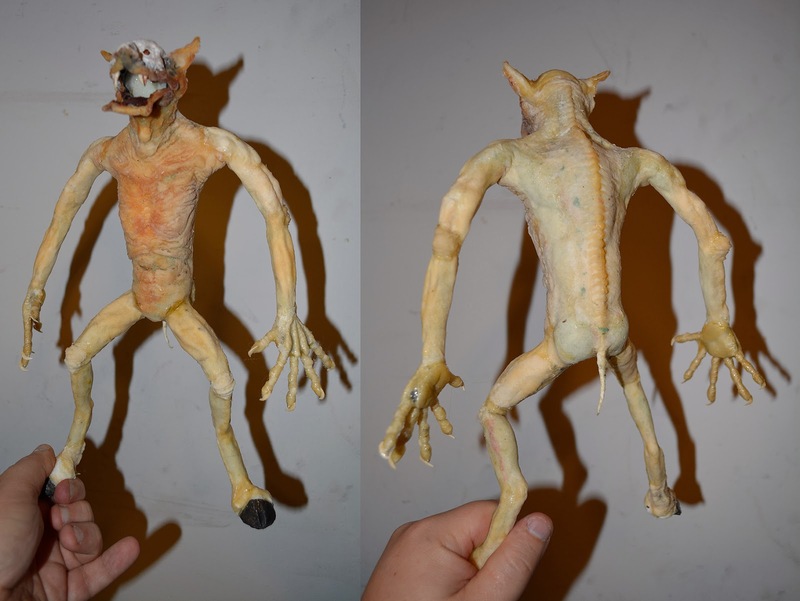 A Chavant clay sculpture was created for the body and head of the ghoul puppet. 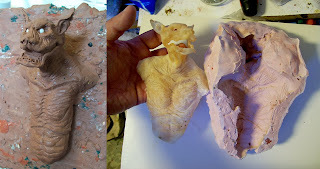 A latex skin was cast from a plaster mould made over the sculpture. I.m very happy with my results using armatures with single thick aluminum wires, instead of several wires braided together, so I keep constructing them this way. 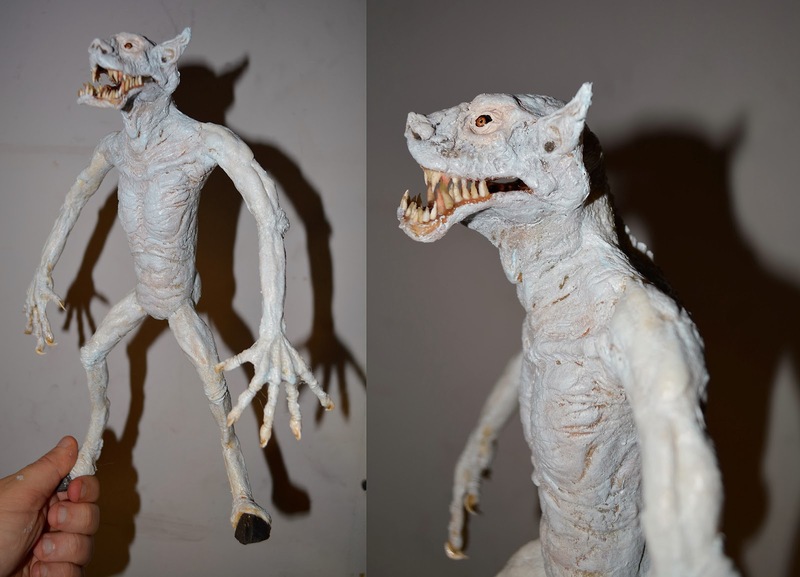 I wanted really defined, sinewy muscles on the ghoul, so I used a mix of thin sheet foam for bigger, softer areas of the body, and latex-soaked cotton strands for the harder, bonier sections. 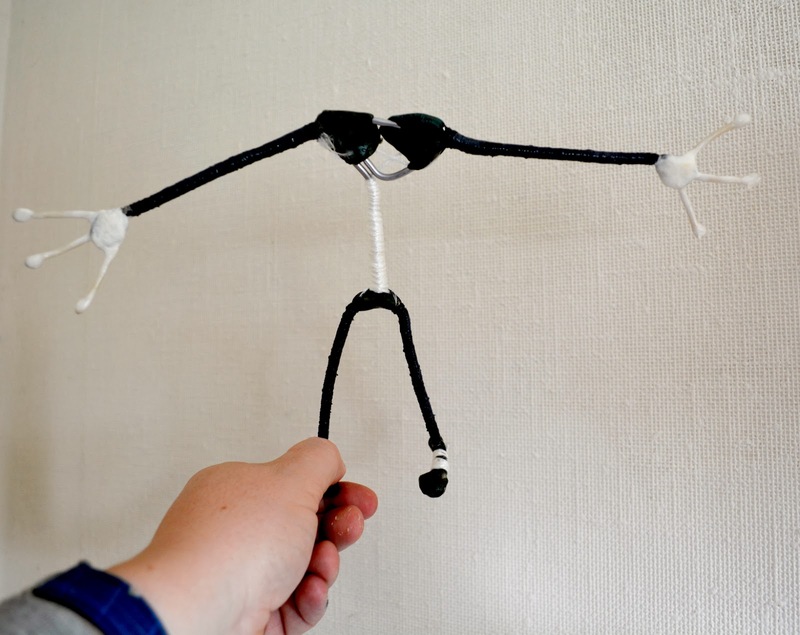 It takes a bit of time to build a puppet up. I spent a full week working on just the muscles and covering them up with patches of cast latex skin. 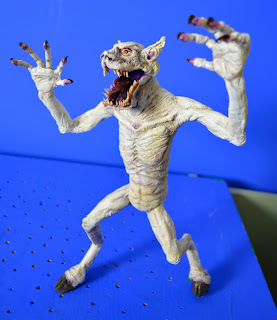 I'm thinking more and more about sculpting whole puppets in clay and casting them in silicone, though that process calls for a lot of time and patience too. As you may see there are some white areas around the eyes on the puppet here. 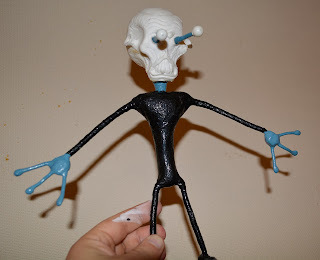 I painted the latex skin with my base paint before putting on the eyes, made from black plastic balls. That way I wouldn't smear any paint on the eyes. 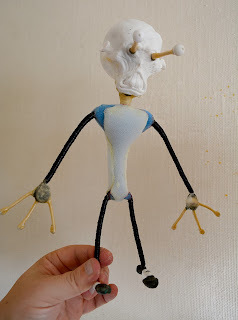 Here the puppet is covered with a thin layer of white base paint, more precisely PAX paint (ProsAide glue + acrylic paint). You can see the eyes better here. I painted a gold-coloured iris around the hole in the plastic ball, thereby creating a weird-looking eye that can be swiveled around by putting a needle down the "pupil" and twisting the ball. The teeth are just small pieces of cotton dipped in latex. So, here's the finished ghoul puppet, hopefully looking every bit the sun-hating subterranean graveyard-dweller he's supposed to be. 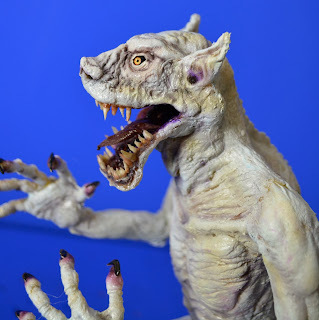 Lovecraft describes them as "rubbery", with canine features and hoofed feet. Ghouls eat corpses, and when we get to Lovecraft's epic "The Dream-Quest of Unknown Kadath" we find out that Pickman has also become an eater of the dead, slowly turning into a ghoul himself. Not only that; he's the chief of the ghouls. My plan was to simply make a nasty-looking monster; not to have it look biologically plausible. But my aim is always to have the overall finished puppet seem believable, the same way the tail-swishing, upright-walking dinos in old "King Kong", though now scientifically outdated, SEEM to our minds to be moving the way a dinosaur should move. In other words, I'm just trying to make good monsters. What about Pickman himself then? My artist friend Niels Elley, who in an earlier project of mine played Gandalf, brought his smock, and his brushes, and kindly stood painting in the empty air for a few seconds in my green screen room. 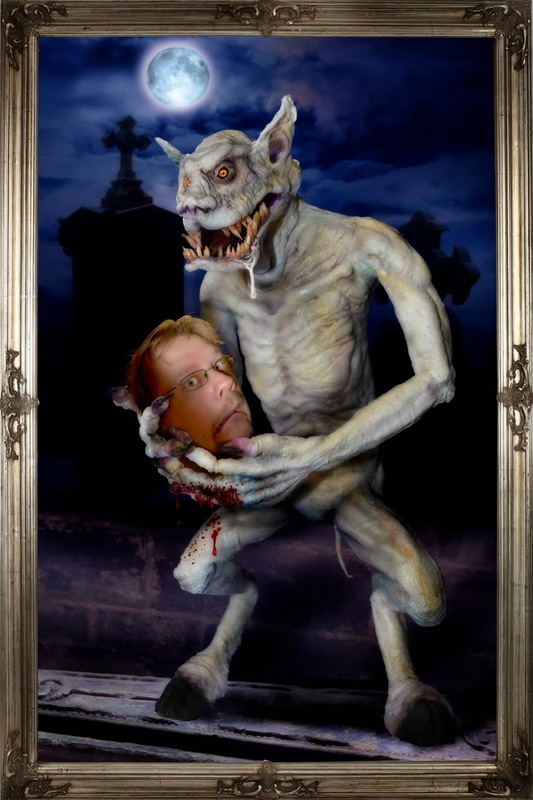 I later added a Photoshopped background, with a canvas and an easel, where I could place my animated ghoul. Thus, suddenly both the artist AND his art turns to observe the observer.